The Trimphone - Tone Ringer Illuminated Model Phone - was hotly sought after as the most stylist telephone of its time. Promoted as sleek, compact, feather light and the phone of the future, its modern looks were further enhanced by the use of an electronic warble ringer instead of the traditional bell. It was initially promoted as a telephone for the bedroom hence, its illuminated dial so that you could see it in the dark. The illumination came from a glass tube called a Betalight inserted behind the dial number ring as shown here in the lower picture. However, this aspect of the design was subsequently dropped because of concerns over the use of the small amount of radioactive gas in the luminous glass tube. The Trimphone traces its origins back to 1961 when the Post Office was looking for a luxury telephone to complement its standard offering of the 700 series model. It was designed by Martyn Rowlands who worked for STC and became available to the public in 1965 as model 712. It was the first Post Office telephone to have a tone caller instead of the traditional bell ringer and its electronic warble was controlled by a thumb wheel on the side of the base unit that had three settings: soft, loud and a mid-way point in which the warble began soft and built up in intensity to loud. 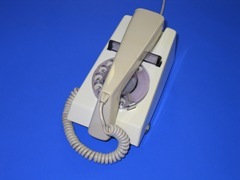 The handset was an L shape design which acted as an acoustic coupler with the electronic microphone actually being located some way up the length of the handset and not in the actual mouthpiece area. The handset rest also doubled as a carrying handle when the telephone was off-hook. The Trimphone handset itself weighed 155g (5.5 ozs) with the complete telephone weighing only 900g (2lbs) however, this was often a cause of complaint because the phone tendered to too easily pull across the table when you lifted the handset to answer a call. The Trimphone was offered in three standard two-tone colour combinations: blue, white and green, with the handset taking the darker colour. In 1971 an updated model, the 722 was introduced that had the same external appearance but used the electronic circuitry of the 746 internally for improved performance. Like all telephones of its period, customers could not purchase their Trimphone but had to rent it from Post Office Telecommunications. The luxury aspect of the Trimphone brought with it an additional quarterly rental charge which, for example, in 1975 was an extra 70p per quarter, rising to an extra £1.25 per quarter in 1982. 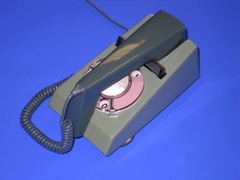 The first push button keypad version of the Trimphone became available in 1977 as model 766. However, the keypad used on these telephones was more bulky that a rotary dial and hence, the casing of the 766 Trimphone had to be increased in height to accommodate it. Early versions used electronic relays for the keypad switching however, these were replaced with all electronic transistor pulse dialling. In 1979 the 786 version was released which used an integrated circuit to provide multi-frequency tone dialling. This new version also attracted an additional quarterly rental charge – even above that of the rotary dial version of the Trimphone. In 1982 this was an additional £3 per quarter. 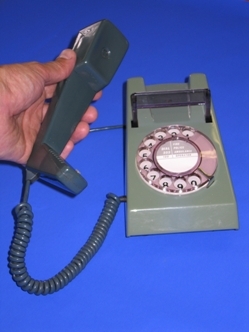 This example of the push button Trimphone is model 8766 and was manufactured by the GPO Factory in Cwmcarn, Wales (FWR) in 1982. In 1979 the Trimphone underwent an upgrade. The rotary dial version was re-launched as the Deltaphone and the push button version as the Deltaphone Deluxe. These models were released as part of the Telephone Special Range as models SR1006 and SR1016 respectively (see separate section on commemorative and special range telephones). However, the most distinguishing feature of these telephones was that they were clad in leather. The Deltaphone was made available in mid brown and in 1982, attracted a one-off payment of £30 with an additional quarterly rental of £2.25. The Deltaphone Deluxe was available in either red or green and in 1982, attracted a one-off payment of £65 with an additional quarterly rental charge of £2.25. 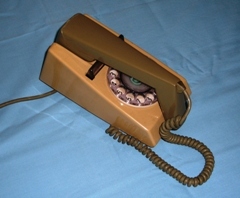 This rotary dial Deltaphone was released within the Telephone Special Range (see separate section on commemorative and special range telephones) as model SR1006A and has the distinction of being covered in brown leather. This particular model was manufactured in 1979 (79/1) by STC at their New Southgate, London factory (STC). The final version of the Trimphone was introduced from 1982. These were offered in a new colour range influenced by leading designers of the day. Lord Snowdon is attributed as being one of those designers and hence, this range is often referred to as the ‘Snowdon Range’. Both rotary dial and push button versions were released in six new colour combinations: olive green/beige, dark orange/orange, dark red/red, black/grey, light green/mid-green and brown/cream. A further change from previous versions was that in light of the creation of British Telecom and the introduction of plug-socket connections within the home, the Snowdon Range was not offered for rental but required customers to purchase their telephones outright. This Snowdon Range Trimphone is presented in the brown/cream colour combination. It is a model 8722 rotary dial and was manufactured by the GPO Factory in Cwmcarn, Wales (FWR) in 1982. This Snowdon Range Trimphone is presented in the brown/cream colour combination. It is a model 8766 push button and was manufactured by the GPO Factory in Cwmcarn, Wales (FWR) in 1982.